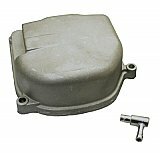 Engine & Transmission parts for 49cc / 50cc 4-stroke QMB139 engines. This engine is one of the most popular 50cc 4-stroke engines used in Chinese & Taiwanese scooters. 50cc 4-stroke QMB139 scooter complete engine assembly. Short case . 50cc 4-stroke QMB139 scooter complete engine assembly. Long case .